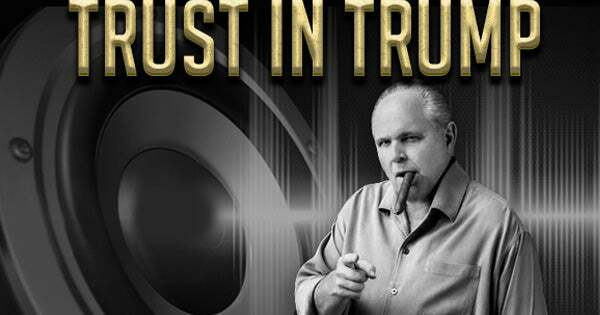 RUSH: You people, you callers to this program made the Sunday shows and cable TV all weekend. It’s the first time. Maybe not the first time in 29 years, but if not it’s rare that the callers, audiotape of callers to this program were played and discussed by David Brooks on PBS, by F. Chuck Todd on Meet the Press, by other places. You’ll hear sound bites coming up. We’re gonna lead with those. (interruption) Yeah, wait ’til you hear this. I don’t know if you heard the program much last week ’cause you were involved in hurricane cleanup and so forth. Have you got your power back? When did you get your power back? (interruption) A few days ago. Still no internet, no TV. Oh, you got that back last night. Okay. So you don’t know what happened. When the DACA, DREAMer thing happened, Trump supporters called and said they didn’t care. They’re gonna stick with the guy no matter what. They think he’s two or three steps ahead of people. He doesn’t really mean it. There’s something crafty going on that nobody — you wait. You’ll hear it. That’s why the callers, ’cause they would not abandon Trump. See, the Drive-Bys are waiting. That’s their prime objective. Separate Trump supporters from Trump. And they thought the DACA deal or making deals with Chuck and Nancy would do it. Now, we don’t take enough calls here for anything to be scientific, but every call we got from a Trumpist — and there were a few of them — not a single one claimed they were gonna abandon Trump. And I had Morning Consult polling data last Friday that shows a majority of Trump people will not abandon him if he indeed grants amnesty to the DREAMers. RUSH: Here’s Chuck Todd, F. Chuck Todd, Meet the Press. This is the show open last night. Give it a listen. TODD: This Sunday, whose party is it anyway? President Trump’s reversal on immigration has conservatives furious. RUSH ARCHIVE: Is he this tone deaf? Is he this ignorant? Does he not know what got him elected? RUSH: Now, F. Chuck, of course they’re trying to stir things up. They would love for me to bail on Trump. They would love to tell people I’m bailing on Trump. That’s not what happened. They took that out of context. Here’s what I actually said. Here’s the whole thing. RUSH ARCHIVE: The first version is what makes the impression. This is a very frustrating thing to me, by the way, because I’m lied about so much, and I don’t respond to most of it. Even when I do, what are the odds? The first thing that’s reported is what people believe. Even sophisticates, even people that understand how the media works, even people that understand the tricks, the subterfuge, the deceit, the dishonesty, even those people fall for the first thing that’s reported. I’m not defending Trump. What I’m telling you, folks, is, I don’t know yet. But it looks to me like Trump is tweeting all morning long that there is no deal, period, and there certainly isn’t a deal on getting rid of the wall. It may happen later, but it’s not gotten rid of, it’s not gone. Boil everything down. Is Trump — I’m asking you, who voted for him, is he this tone deaf? Is he this ignorant? Does he not know what got him elected? And I’m telling you, some of the staunchest Trump supporters are out there, and they’ve jumped ship. RUSH: Now, see, they took me out of context. I was talking about you. I was asking you how you felt. I was not issuing a statement. But look, my whole point. The first thing that’s reported is what people remember. F. Chuck took it out of context. That’s what he heard ’cause that’s what he wanted to hear. He wanted to hear that I had thrown Trump under the bus and overboard at the same time, which has not happened. Anyway, no big deal there. I just wanted to show you how that happens and how, when people are taken out of context, this is how. Now, let me go back to F. Chuck Todd on Meet the Press, talking about the focus of his program Sunday morning asking whether me or Donald Trump hold sway over his base. TODD: Who does control the Trump base? Is it talk radio? Is it Rush Limbaugh? Backlash from high profile members of his insurgent base think Rush Limbaugh. Who’s got more sway over his insurgent supporters, is it Trump himself, or is it folks like Rush Limbaugh? BROOKS: The evidence so far is that it doesn’t really hurt him. There are a lot of people that are burning their MAGA hats, their “Make America Great Again” hats, ’cause they’re upset. But if you look at the people calling into the Rush Limbaugh Show, they want to drain the swamp and they don’t like Mitch McConnell very much. And if he goes against Mitch McConnell and he changes things up in Washington, so far the evidence is they’re willing to stick with Trump and not really walk away from him. RUSH: What is Brooks doing listening to this program? That’s a first. Maybe he didn’t. Maybe he heard about it, ’cause apparently you people calling this program last week was a buzz, buzz, buzz topic of conversation among Drive-By Media types. Here is Saturday, CNN, Michael Smerconish’s program. He’s introducing and playing a montage of calls on this program last week. SMERCONISH: I want to play for you 30 seconds of sound from Rush Limbaugh’s program on Thursday because it speaks to the concern that you have that he will lose his base. Roll that tape. MAN: I’m not gonna give up on Trump even if he starts to move to the left to get something done with tax reform. MAN: I truthfully think he will drain the swamp, and he’s showing people that the swamp has nothing to do with party affiliation. WOMAN: I think that he’s always three steps ahead of Pelosi and the Democrats and the Republicans, and so I think this was a power play that he did. RUSH ARCHIVE: Every Trump person that I’ve talked to, every one, from any walk of life has said pretty much the same thing. If Trump has to work with Democrats to get some of what he wants done, so be it. Now, normally a story like this I would pass over ’cause this kind of claim is ridiculous. The parties are not over. Why are people saying this? You have to keep something in perspective here. If you believe the media of years and years and years of coverage, you would believe that they are desperate for bipartisanship. They are desperate for Washington to work. They are desperate for politicians of both parties to cross the aisle, but especially they want Republicans to cross the aisle. They want Republicans to work with Democrats to get things done. They don’t like gridlock. You’ve heard this I don’t know how many times and how many years. Washington broken, the parties hate each other, so much division, so much partisanship. They treat it as a historical, terrible thing for the country, and they just dream, and they hope, and they wax eloquent about bipartisanship. And now they’ve all heard your calls to this program last week where you said you don’t care if Trump has to work with Democrats to get his agenda passed, you don’t care, whatever it takes. Trump voters are in fact the actual kind of voters the Drive-Bys have been dreaming of. But now they hate Trump voters ’cause they voted for Trump! Here you have the exact voters the media has been claiming that we need. They’ve been clamoring for voters who will do and vote for people who will get things done, who don’t care about party. Of course, that’s BS. I mean, the media wants the end of the Republican Party. Don’t misunderstand. I’m not changing my tune on this. But they’re getting exactly what they’ve always wanted, and they still aren’t happy. It ought to be music to their ears. Trump voters willing to stick with Trump while he works with the enemy, Chuck and Nancy, if that’s how he has to get his agenda done? What it really means is that Trump voters really don’t care about party. They care about honesty and fealty to issues. And right now, Trump voters, I don’t care if they’re Republican, Democrat, or independent, are livid at Republicans. Because Republicans ostensibly are the same party that Trump’s in. So theoretically they should all be unified, working together to advance a common sense agenda. But it has become very clear that the Republicans in Washington agenda isn’t what Trump’s is, and so there isn’t any cooperation. And I say again, this is where it’s so shortsighted. If these guys — and not all Republicans are this. Some of them are willing to work with Trump. Freedom Caucus, you know, Mark Meadows and Jim Jordan, a lot of them there, but they’re not a majority. And certainly the leadership in the House and Senate are still opposed to Trump. Can you believe, in these past six months, if just for three of those months there had been unity in the effort to repeal and replace Obamacare, to get started on real tax reform that includes real tax cuts, and if there had been movement — you don’t have to get signed legislation on all three of these. If there had just been serious movement with the appearance of genuine unity on those three things, then the Democrat Party would be out of existence for the next 20 or 25 years. Now, there would have to be something done. Those three items, something would have to happen. You can’t just survive on effort alone. There would have to be some success. But there hasn’t even been that. And there’s still time for it in the next six months, ’cause the 2018 midterms are coming up. And the way it’s going, if they’re not careful the Republicans could lose the House in 2018, folks. There are a lot of Republicans talking about retiring, a lot of them from California. You don’t want Republicans quitting in California. That’s the easiest state for Democrats to claim seats because I don’t care how districts are drawn; the overall party imbalance there is way, way out of kilter. Republicans hardly exist. They could lose the House. And they could forestall that if sometime in the next six months if there were just three months where they were working together on the agenda. Trump’s not blameless. Don’t misunderstand. But neither were they. There are ways this could happen. But Trump voters realize there isn’t any such effort and probably isn’t any such desire on the part of the Republican leadership. So when Trump says he’s gonna do whatever he has to do with Chuck and Nancy to deal with the DACA, the DREAMers; and if it means the wall is gonna get built, they’re all-in; they’re not gonna abandon Trump. And the Drive-Bys heard this and were playing your phone calls all weekend long, ’cause it depressed them. They were sure, they were sure that Trump working with Chuck and Nancy would force you Trumpists to abandon him in droves. Instead, you know what’s happening? Democrat voters are ticked off at Chuck and Nancy. The hatred for Trump is so bad, they don’t want Chuck and Nancy, even if it advances every left-wing agenda item, they don’t want Trump being part of it. And they’re ticked. It turns out that the greater harm here is actually happening to the Democrats over this. Another bit of news that doesn’t fit inside the old consensus of conventional wisdom.